Often times finding a new qualified security director or security manager requires an extensive search and more than the average amount of time. Workplace violence ranges from verbal threats to homicide, and in many cases there are warning signs in advance of an incident. Workplace violence is not going away, and one only has to watch the daily news to see examples of it throughout the United States. Protection Management LLC, provides security consultant services for attorneys litigating negligent or inadequate security claims, intentional torts, or criminal acts. When you are planning a large event, whether it is a concert, festival, political rally, wedding, graduation, company party or any other event expecting a potentially large crowd, Protection Management, LLC is ready to assist you. Protection Management, LLC works with clients to identify their needs and tailor the assessment to work towards a common goal as established in writing. Protection Management, LLC is a full service professional security consultant company serving North America and Europe with all of their crime prevention, loss prevention, security management, workplace violence, and security assessment needs. We also provide services as a security consultant expert witness in security litigation cases. Our principal security consultant John M. White, CPP, CHPA, has been a security consultant for over 39 years to all types of businesses and activities. "I would recommend John for any security position or contract within an educational setting. John understands the complexities of providing youth a secure environment while respecting their individual needs." "John and his team really know their stuff...."
The entire project was extremely thorough. John set and communicated expectations very well, was consistently professional throughout the process with myself and our personnel, gave immediate feedback during the assessment, and provided excellent and detailed insight within the final report. Well done, clear, and fair proposal. Onsite surveys were extensive, often lasting throughout the day and evening, often ending at midnight ensuring all observations could be made. Very professional and well received by all staff members who were above to participate. Staff was very comfortable in expressing their observations, experiences and opinions. We appreciate the depth of the study performed and concise recommendations provided. Recommendations were realistic to our setting, and with the protection and security of our staff and patients in mind. Recommendations were current to federal and state initiatives and laws. The common-sense surveyor had real world health care security experiences, current with the events of today such as mental health and shootings, able to relate and address our needs and concerns. Very helpful! "Mr. John White of Protection Management, LLC was extremely professional and thorough. His final report was easy to understand, even for those of us who aren't savvy to security protocol and standards. He spent the entire day on our campus and even came back at night to fully assess all times of day. I would highly recommend him for any security assessment." Protection Management, LLC is a full service professional security consultant company serving North America and Europe. We are Board Certified in Security Management; Certified Protection Professional (CPP) by ASIS International, acknowledged as the security profession’s highest recognition. Access free security documents, policies and forms like a Security Assessment Checklist, Security Risk Assessment Report, Home Security & Personal Safety Tips and more by signing up for an account below. 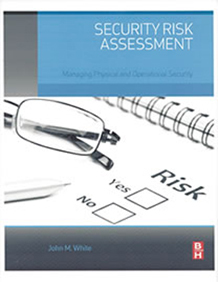 (You must enter a password found in Security Risk Assessment by John M. White to access free content.) Please note that new items will be added from time to time so if you do not see something you need, please let us know and we will see if we can provide it to you.